SFW123ES Digital Fire/Water Safe is rated 4.6 out of 5 by 38. 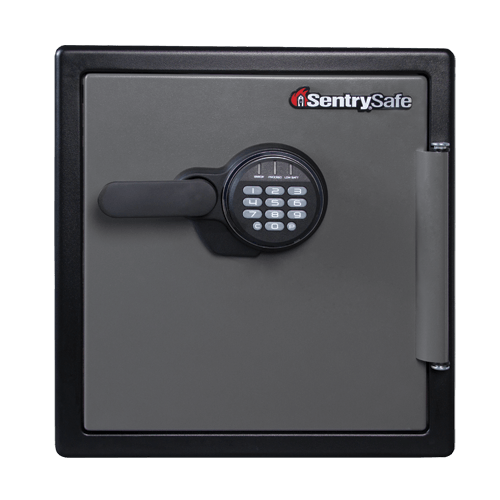 The SentrySafe Digital Water and Fireproof Safe SFW123ES offers reliable security for your valuables with solid steel construction, a pry-resistant hinge bar, and four large, one inch bolts. 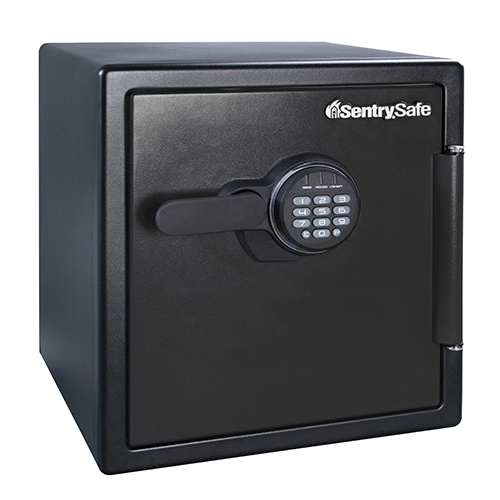 Designed with an interior key rack, door tray and door pocket to keep your items organized, this safe is ideal for your home and office security needs. Rated 5 out of 5 by Mike56 from Not yet Used I'm sorry to say I have not been able to use the safe yet. I've been very busy and need to bolt it to the floor before I start using it. I gave it five stars due to the fact I like what I see so far. Rated 5 out of 5 by Best NaNa from Peace of Mind I am very happy with my purchase of this safe. It is just the right size for my important documents and treasures. I feel much more secure knowing my things are safer. The only thing I wish was that I could submit all of my items with the monetary value on an online Registration for the Guarantee/Warranty. The form is really small print and hard to read. 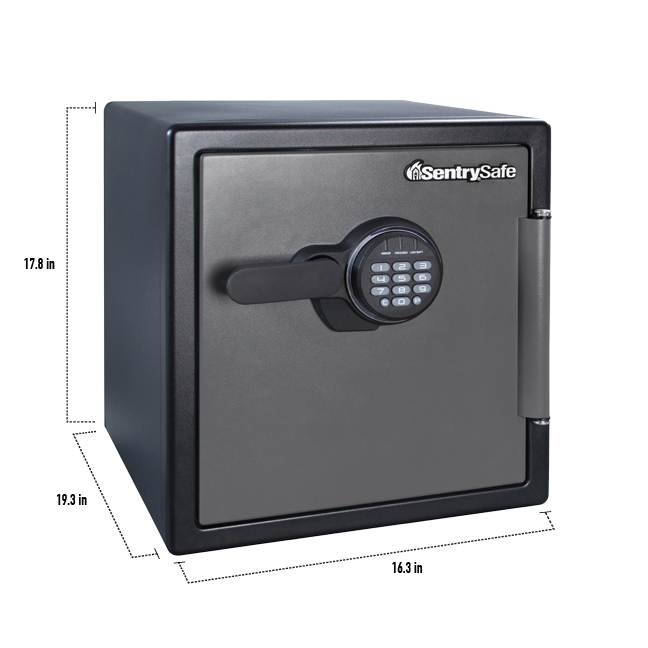 Rated 4 out of 5 by AndreaT from Serves its purpose This safe is large enough to store binders, all important paperwork and valuables. It has good fire and water ratings. It is heavy duty, secure. It ws not so heavy that I couldn't move it around the house. The one disappointment is that it did not come with bolt down hardware which I would have to buy separately. That was not obvious from the literature. Rated 5 out of 5 by Vishal37 from Strong and Easy to Setup Safe I've only had this safe for a few days but from just looking at the construction of safe, it looks like it is really well built and secure. 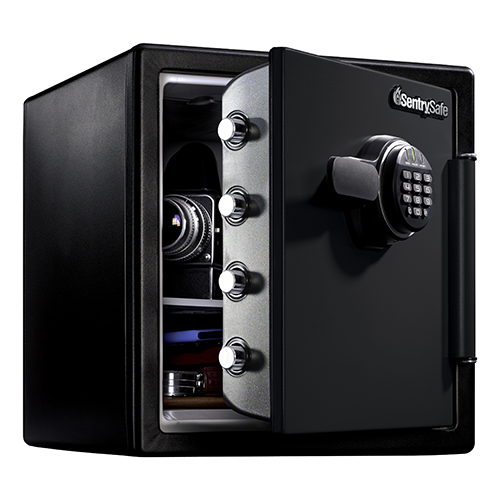 Aside from the superb construction, the safe itself was easy to setup. I like the fact that I can change the batteries on the keypad without opening the safe. Rated 4 out of 5 by Derek lfc from Fire and waterproof safe The safe is well constructed both inside and out.The only one thing that stops me giving it a 5star rate was when you register online you put your 5 digit manufacturing code in registration.Then when you come to change your code it will still open on yours and manufacturing code and I’ve just put that in a email register mmmmmmm bit bad if anyone taps in to my emails. Rated 2 out of 5 by MommaBear2theRescue from strong safe and perfect to keep meds safe I do love this safe cause it helps keep kinds safe but not don't like that you can't delete the Factory Code. Think for money spent to not be able to do that makes this product not as safe as it should be.